I’ve ranted against the bottled water industry before. It’s a completely useless product for most people, who have perfectly good water in the taps. It privatizes water supplies for profit, which is antithetical to basic moral values. It drains local water sources and spreads that water across the world. Mostly, it just doesn’t need to exist in the United States. Yes, there needs to be bottled water to step in when vile Republicans poison the people of Flint or if you have high sulphur concentrations in your water, such as I have experienced in West Virginia. These are problems easily solved without half an aisle in Walmart dedicated to bottled water. Understanding that this industry was unnecessary and wanting to reduce pollution, the Obama administration stopped the selling of bottled water in national parks. With plentiful drinking fountains, this was not a problem. But of course, Trump would not only repeal this rule, but also named a former bottled water industry lobbyist as deputy interior secretary. Of course, like every regulatory issue, the problem is not Donald Trump, but the Republican Party. The decision came three weeks after the Senate confirmation of David Bernhardt as deputy interior secretary. 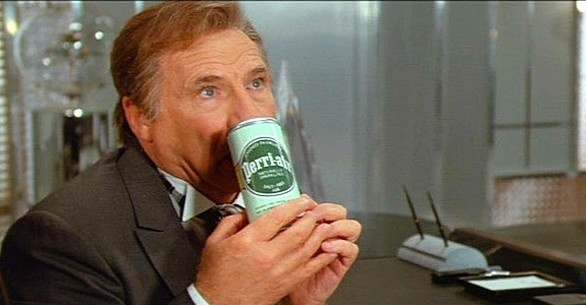 Bernhardt is a former lobbyist with the law firm Brownstein Hyatt Farber Schreck, which has represented one of the largest water bottlers in the United States, Nestlé Waters. Nestlé distributes the Deer Park brand. Let’s not just hand the oil and gas on public lands to corporations, let’s hand them all our water too! After all, we’ve already allowed corporations to own our food supply through the revolting decisions that force farmers to buy seeds every year from Monsanto, ADM, and other agribusiness companies. Might as well just give Nestlé water too. Years ago, at the top of Pikes Peak, I was struck by the presence of machines from which you could get a breath of oxygen (presumably not pure, but possibly packaged in sea-level atmosphere; if I took note of the details then, I have long since forgotten them) for a quarter. Presumably it’s only a matter of time before Nestlé gets into that business in a big way. Nestlé under its new CEO, Vilos Cohaagen. There are all kinds of regional differences in water quality. I don’t think that explains the bottled water craze, but not everyone has good tasting tap water. From a policy perspective, I think it’s reasonable to try to improve the quality of drinking water if your goal is to reduce the consumption of bottled water. Well-maintained and convenient drinking fountains and places where you can fill up containers of filtered water would also help. Temperature matters. People want cold water, and tap or fountain water isn’t often cold enough. Also, drinking fountains have to be chewing gum free. Bottled water doesn’t stay cold for long either. Which is why if you really like cold drinking water, you should pour your nice tasty tap water (or filtered, if necessary) into a thermos bottle. They keep stuff cold just as well as they keep it hot. Forget it, people always get defensive about their luxuries. I’m honestly just interested in the various policy considerations. I think most bottled water isn’t being consumed for practical reasons, but any regulatory action needs to take disparate impact into account. Assuming a maximalist approach to the problem (“it is now illegal to sell still water in plastic containers smaller than 32/64/128 oz.”), I think most affluent people would be mostly unaffected — affluent urban people already have Hydroflasks, water filters, etc. I would prefer not to tell poor people in areas with unpleasant-tasting water that they need to buy a filter if they want to stay hydrated. I think the likely result is that a lot of people drinking bottled water now would start drinking pop instead. As for water fountains, I just think people should have easy access to hydration on hot days and the like. As long as the fountain is well-maintained, the water doesn’t need to be cold to do that job. I am comfortable with saying “if you want cold water whenever you want it, fill a thermos and bring it with you”. I agree. So just get the big square Brita with the spigot and throw it in the fridge. Or keep a pitcher of filtered tap water in the fridge. Or put ice in filtered room temp tap. I’ve done all three at different times. There are a lot better options than buying bottled water (that often is just tap itself, and that may even have a bunch of “estrogen” to boot). But often I am not home, and yet still want cold water. Well, that’s what I do, though no need for a Brita. But trust me, bottled water drinkers complain about tap water being too warm. Can confirm. I drink water drawn straight from the tap and people occasionally find it worthy of comment, sometimes surprise or shock, and once or twice even disgust (as in “ugggh how can you drink warm water?”). But wanting “cold” water is a luxury. Also, you can just fill a pitcher with tap water and stick it in your fridge if you’re that much of a prima donna. If your water is potable, you don’t need bottles. We should tax the bejeezus out of bottled water. Calm down. I don’t drink bottled water – i have good tap water and keep a pitcher in the fridge – I’m just explaining what other people do. The two rules of drinking in the US are (a) must be ice cold and (b) can’t go anywhere without a beverage in hand. When I went furniture shopping last year they offered us bottled water to drink when walking around the store. Yeah dude I’m just out of control. What a rejoinder. You misunderstood my previous post and called me a prima donna. I think I had a right to a rejoinder. Oh for crying out loud. It was clear to everyone that you were talking about what other people do, therefore it was also clear that Vic’s reply was using “you” in the sense of “one” or “a person”, not YOU. “Calm down” was ridiculous. When a person is about to write an insult because they think it’s their “right”, maybe a person could take five seconds to wonder whether they themselves might have misunderstood the previous post. Ironically, I think part of the reason for that is that people have been convinced that it’s necessary to constantly be hydrating or else you’re going to keel over dead. The health benefits of water consumption have been wildly overstated. I say this as someone who drinks about a gallon of water a day and is basically a semi-animated corpse half the time. That’s probably a good part of the issue as well. Faucet filters work, too. My kid in DC uses a Britta, in RI I use a Pur. Filter is initially $16-$30 bucks, installs in minutes without crawling under the sink, replacement filter is $9-$12 (or Target’s generic replacements, even cheaper) and we replace ours only 2-3x per year. I solved the problem of awful-tasting water by just not drinking plain water anymore. My sister uses one of those high-dollar osmotic filtration systems in her house but I get along fine with a Brita pitcher and an extra two-gallon container (with spigot) in the fridge. With just my wife and myself using it, a filter lasts a good six months. Cape Girardeau (MO) water is fine to start with; micro-filtered, you couldn’t ask for better. ETA: I prefer the pitcher filtration system to the faucet attachment (which is a clunky thing that spoils the pulchritude* of your kitchen sink area). ETA2: If you buy the five-pack at Sam’s Club or Costco you get down to a little more than eight dollars each for the OE Brita filter cartridges. That’s around half of the per unit MSRP. *I’ve just been dying to use that word for a while, now. Finally got it out of my system! We used to have a reverse osmosis system. It turns out the fancy membrane in those things is poisoned by–guess what?–chlorine, so you need to run a huge charcoal filter in front of them anyway. I re-plumbed the RO system so it’s just the charcoal filters now. Thirty bucks a year for filters. I did spring for a fancy Kohler kitchen faucet that has a separate tap on the side for the filtered water system. Worth it for the decluttering…but we cook a lot and the spouse drinks upwards of a gallon of water a day. I lived in DC too and the water tasted awful. But you still don’t “need” bottled water if the water coming through your pipes is potable. I used a Brita. The Guardian has had a couple of good articles on this: one on the marketing of bottled water, and another on all the plastic bottles. Trump’s truly unrivaled level of corruption has masked, to some degree, the corruption of ordinary Republican governance– even though the latter has itself long since descended to levels unworthy of a third-rate kleptocracy. American administrative law seems to be completely incapable of handling the problem of corruption. The entire system is modeled on the naive belief that agencies will be run by rational people coming to decisions through reasoning, not by thieves who come to decisions based on what best lines their own pockets. Nestle’s Poland Springs division just got sued for allegedly selling/marketing bottled ground water as spring water. year from Monsanto, ADM, and other agribusiness companies. Dude, no one’s forcing farmers to buy those seeds, they could always buy the non-GM seeds that aren’t copyrighted and save seeds to sow the following year like they use to. If we could get people to realize that not all crops have to look picture perfect we could go back to using hardier heirloom crops. The fact is farmers are buying those seeds because they’re the best bang for their buck. Then they’re complaining the law prohibits them from using money saving tricks like saving seeds. Look, I get it, it would be better for them if they didn’t have to do that. It would also be better if the big mega-farms and mega-marts didn’t lower prices to the point where normal people can’t compete and make a profit. Hell most people aren’t even forcing people to buy bottled water, invest in a canteen and bring your own like a proper hiker and you won’t need bottled water at all. The most I’ve done is buy one bottled water and refill it from the tap whenever it got low (bathroom water: no one will restrict it). You people drink water? Like out of the toilet? Lewis Black has a fantastic rant on bottled water. I think it was the first bit of his I saw, and sold me completely.